They say that, if you are to be successful in shooting birds out of a covey of partridges, the trick is to be relentless focused on the bird you plan to shoot, ignoring everything else. The challenge of finding worthwhile art at the Summer Exhibition is much the same. You scan the room, home in on one or two images which might delight you and pretend the rest is not there. There is so much in the exhibition, and so much of it is uninteresting that any any more methodical approach will likely grind you down before you find anything to enjoy. Despite that rather cautionary introduction there are some diamonds hidden on the walls which are worth seeking out. This year I particularly enjoyed the contribution from Timothy Hyman, an RA himself and a teacher of art who has brought a number of interesting artists like Henry Kondracki and Jiro Osuga. 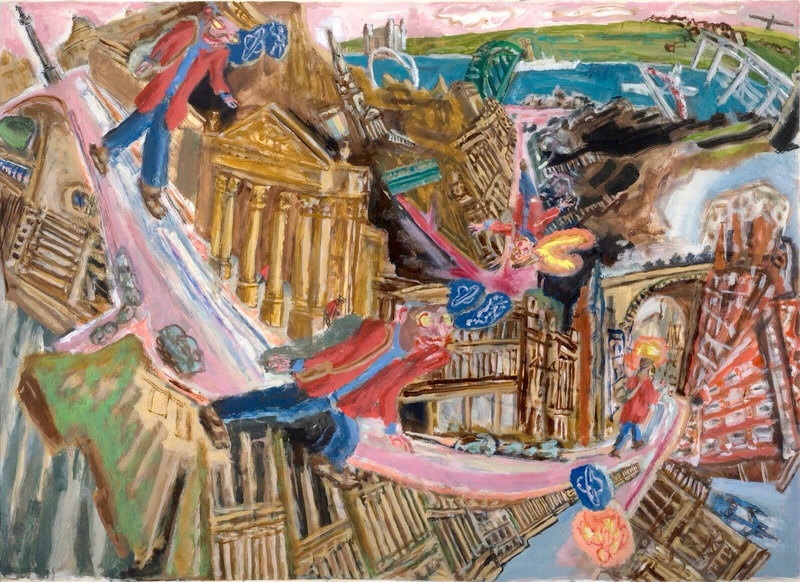 His slightly anarchic scenes of London life burst with energy and creativity and, compared to much at the exhibition, represent excellent value for money. 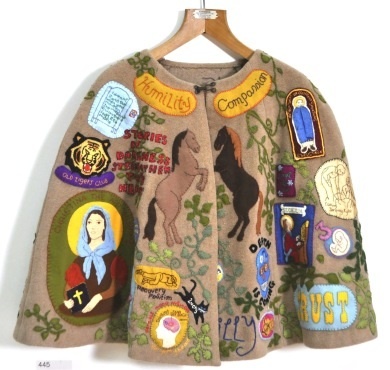 I was also very taken by a decorated child’s cape by Eve Gonzalez. The whole obj is pure Grayson Perry but it is very nicely done and brings a smile. And finally, it is worth seeking out an enormous lino cut by Richard Galloway, called 15.35. It is complex allegorical scene of modern life which also draws much from Grayson Perry but which demonstrates a fertile imagination, a mastery of drawing and an ability to use scale to tell a large story, rather then telling a small story in large letters. Are these the only good things in the exhibition? Of course not. There are some good works in tribute of John Bellany and Alan Davie who both died in the past twelve months. There is a large, sombre piece by Sean Scully which will rightly end up in a major public collection, and an interesting and very different piece by John Walker the Birmingham-born artist who has now been long resident in the US. And of course there are lots of individuals work which will attract your focus but not mine, or vice versa. The Summer Exhibition is what it is, a scrambled collection of art and artists to satisfy every taste. So everyone will find something to admire and much to disparage. Go on that understanding and it is worth an hour of your life. Posted in Art, Exhibition Reviews and tagged Art, art review, Eve Gonzalez, RA, Richard Galloway, Royal Academy, Summer Exhibition, Timothy Hyman. Bookmark the permalink.